The Geomancer by Clay and Susan Griffith is a further instalment that brings to us the very readable world of The Greyfriar (Gareth) and the Empress of Equatoria (Adele). This is the fourth story set in this unusual alternate world and whilst I will try to avoid spoilers for this particular novel this review may contain spoilers for previous books. To be honest – I wouldn’t advise reading this as a standalone, but I concede I may be too close to the characters here and simply want you to read all the books – check out this great review by Mogsy at the Biblioscanctum who thinks this can be read without the first three – in which case – dive in! My original review for this was posted at The Speculative Herald and this is an abridged version. I’m not going to give a long description about the past history – my previous reviews are here for The Greyfriar, The Riftwalker and the KingMakers. They’re all great stories! At the conclusion of the Kingmaker’s Adele was manipulated into using a surge of geomancy which wiped out the British clans, freed the land from vampire rule and created a protective barrier to prevent their return. Unfortunately, it also left huge scars on the natural rifts and badly drained Adele. On a recent visit Adele and Gareth discover that a number of grisly murders have started to re-occur in London. The vampires could be returning and it appears that Adele isn’t the only geomancer. It seems she has a rival called the Witchfinder. The Witchfinder works for the vampires and is discovering ways to protect them from Adele’s power and also to use geomancy in a way that will kill humans instead! And so we enter a race between Adele and the Witchfinder to try and find an ancient artifact that could spark an apocalypse. I think this was my favourite of the series so far. It has perfect pacing and plenty of action. There are a number of tumultuous battle scenes with airborne scenes of vampire fighting vampire, some amazing locations and further character development accompanied by excellent dialogue. The winning element is Adele and Gareth. They have a strong relationship and seem so much in love that it’s impossible to read these books and not become involved. 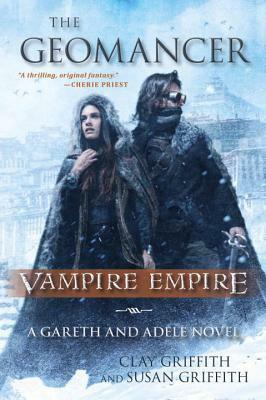 This isn’t an easy relationship – Adele is human and Gareth is a Vampire. Adele is strong and stubborn. She will do anything to protect her family, friends and people, she has a vision which doesn’t involve one race wiping out the other, plus she carries a shining torch of optimsm. Gareth differs from other vampires. He believes his race to be ultimately doomed, he believes he’s the only one to treat humans with respect and is more despondent about the future. He lacks Adele’s belief that both species can live together. Anhalt also makes a very welcome appearance. I do like this character. He’s so very proper! You feel for him as his battle wounds are taking their toll and he’s not the sort of character that waits on the sidelines while the action plays out. We pay a visit to Adele’s brother Simon – this was an interesting development. Simon is growing up and starting to rail a little bit. He gets left behind with the boring paperwork while Adele dashes around the world pursuing adventure. I wonder where that element of the story might take us. These books are well written and easy to read. They convey a wonderful amount of detail without slowing the pace or becoming tedious. In this particular story we once again visit Paris which is simply a great setting with the ruined city, dereliction and catacombs adding a dark and seedy element to the vampire world. We also travel to a hidden monastery in the mountains of Tibet. This was a really surprising element to the story and one I really enjoyed. I can’t go into a lot of detail because it will give too much away but it’s at this point where we finally start to see something of a breakthrough in terms of the way that vampires and humans regard each other. In terms of criticisms – well, I would have liked some more detail about the Witchfinder and his motivations but although this might be lacking slightly there is another evil baddie on the scene – who, again, I can’t really say anything about. I really enjoyed The Geomancer. It has a great plot with lots of potential for future storylines. 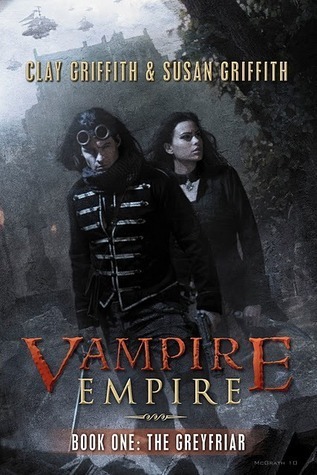 If you’re looking for a vampire story with a difference, plenty of action, steampunk and romance then I strongly recommend this series for you. I received a review copy courtesy of the publisher for which my thanks. The above is my own opinion. The Kingmakers is the final instalment of a vampire series written by the Griffiths and encompassing steampunk, war, love and vampires. 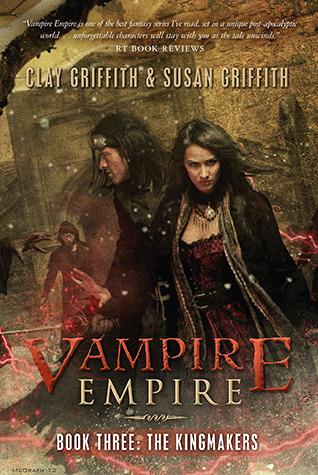 The Griffiths have managed to bring an alternate history to life where great swathes of the world have been overtaken by vampires. They’ve taken the idea of vampires and using a combination of fresh ideas and old myths created something very original. If you haven’t read the first two books you may want to step away from this review now as it will undoubtedly contain spoilers. You have been warned. Kingmakers gets off to a fairly immediate start. The war between the vampires and humans is on and the battles are becoming desperate and bloody. The Greyfriar (or Prince Gareth) does his best to even the odds fighting out at the front with the army but even his expert fighting and swordsmanship cannot deny the simple fact that the vampires seem to be gaining ground. Desperate times call for desperate measures and so Adele takes a different and more cunning route and using her geomancy sneaks into the very heart of the vampire lair to practice her own special weapon of mass destruction. This of course brings inevitable qualms about using such a weapon. Meanwhile the jilted Senator (Clark) has returned to the US and has begun his own war with the vampires using his ruthless policy of ‘killing the herds’ – yes, he’s killing the people who the vampires feed from. He’s decided that they’re little more than cattle and has managed to justify it to himself – it doesn’t seem that others from his immediate circle are quite as comfortable with his methods. Gareth is also facing his own personal demons. King Dimitri has been declared dead and Cesare is about to call a meeting of the vampire leaders to choose a new ruler. Of course he is expecting to be uncontested and just to help sway the vote will be inviting along a number of dignataries from those countries who have now allied with him. Gareth seems finally to be experiencing a moment of doubt and comes up with a plan to once again join with Flay in a bold attempt to kill Cesare and be crowned King of England. Oh, and Mamarou – well, we’re about to find out a little bit more about what really drives him and to exactly what lengths he’s prepared to go to in order to succeed. So, all the pieces are set out nicely with all the key players poised to jump into the fray. I thought this was a very satisfying conclusion to the series. I did wonder how the authors would pull it off but I think they did a great job. This book undoubtedly has a slightly different feel than the first two. In fact I think all three books have differed in certain respects. In Kingmaker the action is virtually instantaneous and non stop. There are plenty of tense moments when key characters seem to take incredible risks and you actually wonder how they’re going to survive. There is betrayal and politics and a little bit of heartbreak but the plot is lightened by the interaction between Gareth and Adele and the humour they share. Adele has really come into her own as a ruler and her people certainly do love the idea of her and the Greyfriar. Gareth on the other hand, whilst still playing his loving self, coupled with the aloof and cool exterior that he shows to others, seems to suffer from a little bit of anxiety about what is place is going to be exactly. In fact there’s a question mark hanging over the future of the the Greyfriar. Given the ending – which I’m not going to share at all – it’s going to be very interesting to see where the next series, that starts very soon with the first instalment called The Geomancer, takes us next. I think this has been a really good series and I can’t wait to pick up the next book. I was provided with a copy of The Kingmakers courtesy of the publisher for which my thanks. The above is my own opinion. 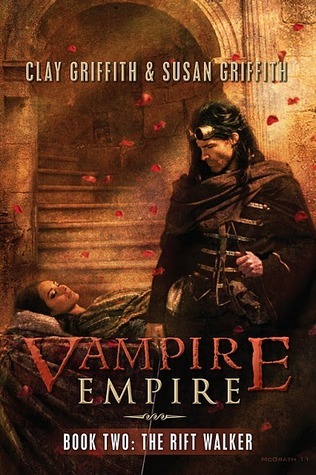 The Vampire Empire series has been around for a while and was one of those books that I fancied reading but then hit that ‘had enough of reading vampire novels’ type of feeling. Fortunately I’m over that little wobble now and having read and enjoyed the first book I have more to look forward to and no tedious wait inbetween – win! So, Greyfriar is one of those books with a bit of a vampire romance in it. Whilst all the other vampires are nasty and loathsome this one poor vampire is the odd one out, he ‘feels’ for humans, he finds them fascinating, in fact frankly, he prefers humans to vampires and sees a world in which they can co-exist. That probably sounds cheesy and if I’d read this a few years ago there would have been some rolling of eyes. As it is I just really enjoyed this, perhaps I was simply in the right frame of mind but rather than following the ‘cheesy and perhaps cliche’ fork in the road I opted for the ‘really enjoyable and compelling’ route. Vampire Empire is set in a world where vampires, no longer content to survive in the background join together in a massive all out war against humans. Many people die and the vampires take over control of great swathes of the world – particularly those that enjoy a less tropical style climate. Whilst the war took place around 1870 the book is set in a slightly futuristic time – and yet it feels like a much earlier date historically speaking. I think this is based primarily on the fact that the vampires mainly destroy, they take over cities but they create nothing. They rely on humans to build things and to also keep them alive! I guess that many of the innovational leaps and bounds that humans would naturally have made under different circumstances have been put on hold while they try to stay alive and come up with plans to take back control of the world. At the start of the story, Princess Adele, heir to the throne of Equatoria is embarking on a journey to see her subjects. This is a fore runner to her impending arranged marriage to a US Senator and Vampire killer/hero. A diplomatic trip but one that goes horribly wrong when the vampires attack the dirigible they’re travelling on. During the vampire attack Princess Adele becomes separated from the rest of the people and assisted by the man known as Greyfriar – who is something of a legend by all accounts. A man so mysterious that nobody truly knows who he is – or for that matter if he really exists – until now. Now, from here the story takes a bit of a capture, escape, capture, escape scenario so I won’t elaborate too much upon that. For me, one of the best things about the book is the vampire politics and in-fighting between families and other clans. The king’s two sons particularly share a good deal of animosity. There’s the mystery surrounding the Greyfriar. There’s an additional element of mystery surrounding Adele who seems to enjoy some form of special ability herself – there’s also a very curious magical element that is presumably going to be explored in future books and three is the promise of a slow building romance. Characters. I liked Adele. She’s resourceful and she doesn’t mope about. She goes through some tough experiences yet manages to keep a clear head. Her intended, Senator Clark – well, he’s a bit of a cardboard cutout which is a bit of a shame – he’s very wooden and totally an unsympathetic character. Everything he does simply makes you dislike him more, even though he’s supposed to be one of the good guys and clearly this is a ploy to make you have no guilt for preferring the Vampire Gareth instead of Adele’s human intended! That being said, yes, the Senator is a bit cliched but the vampires have a number of new traits to explore. They’re violently ruthless and herd humans like cattle draining them dry and flinging them aside like rubbish. Unbelievably I actually like the character Flay – she gives a good insight into the vampire psyche and it isn’t pretty. On top of that there are a few myths put to rest and new elements such as flying – no transforming into bats but just super light bones similar to birds. The plot, as I said above, follows a capture, escape and run and hide format. It certainly isn’t boring – in fact quite far from it as there is plenty of action along the way. The world building doesn’t take too much imagination – it’s pretty much the place we know already but set in an alternate history. For example, London teeming with vampires who perch like gargoyles atop the city’s famous landmarks and Buckingham Palace now home to the most powerful vampire family. Okay, the real winner of the story for me was the romance – it’s not overly done at all or in your face. In fact it’s not the main element of the story at all and really only becomes obvious towards the conclusion of the story. I think that’s probably why I liked it here – it’s subtle. But, I liked the slow build. The understanding between the two characters and, yes, this almost had a Beauty and the Beast type of feel to it. You really can’t help feeling drawn to Gareth he’s a vampire but, put simply, he acts like he wants to be human – which is kind of ironic! I had a couple of criticisms. The reckless killing of humans by the vampires was one – I totally understand that the point is being hammered home a lttle to reinforce how nasty these vampires really are – but it got to feel a bit over the top and I couldn’t help wondering how they even had any herds left to feed upon at the rate they were ‘eating’ their livestock. I was also puzzled about the vampires in general – they literally do nothing. They’re immortal, they live forever and can’t sleep and yet they just seem to sit and wallow – they don’t create, build, read or write. They don’t cook and now that they’ve conquered the world they don’t even hunt. They really come across as being terribly bored and who can blame them – perhaps that’s why they fight amongst themselves so much. Really – what do they do for eternity! Anyway, in spite of a couple of little niggles I thoroughly enjoyed this and look forward to reading the next instalment. A strange fusion of dark and brooding vampire horror, steampunk and alternate history interwoven with the subtle beginnings of a love story and the catalyst for future adventures.